Tunnels conjure images of dark, dank spaces where mystery and danger lurk around every corner. Combine this preconception with a religion notorious for its secrecy and rituals and you’ve got a juicy recipe for conspiracy. Most major cities have an underground network of tunnels–especially cities that are more than a century or two old. 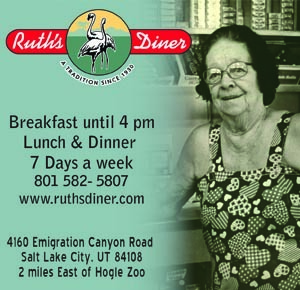 Salt Lake City is no different. Basic physics require that most major buildings extend well below the street level. If a connection is sought between two buildings, generally a tunnel is the easiest way to do this. Shelter, security and privacy are guaranteed. These are practical qualities that any business or organizations might desire, but should the two building happen to be the corporate headquarters for the LDS Chuch and the closed-to-the-public Salt Lake Temple, the stories surrounding these very real tunnels told by those both inside and outside the faith are now as a common as they are imaginative. Underneath the Mormon Temple in Downtown Salt Lake City a series of tunnels spreads out in all directions. The earliest written mention of this is in 1889 by John Nuttal as he writes in his diary about a tunnel connecting the temple and the annex building next door. 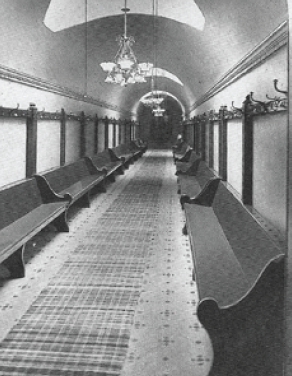 The tunnels were built to enable LDS officials to walk back and forth from their offices to the temple without walking through the public or the weather. The next mention of the tunnels in the media was highly controversial. In 1911, a 21 year old Prussian convert named Gisbert Bossard gained access to the Temple and took 68 pictures of every “nook and cranny” of the interior. The initial intentions of his actions is unclear but what is known is that he tried to sell the photos, host his own show exhibiting the photos and finally extort money from the church for the photos. The church quickly replied by publishing their own photos to steal Bossard’s thunder. The big question was how he had gained access? Befriending a gardener in charge of maintaining the flowers inside the temple gave Bossard the access he needed. 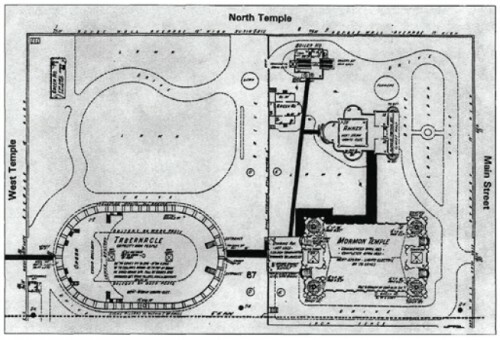 Bossard explained, “There is a tunnel that runs to the Sharon building and the Hotel Utah… We found a spot on the temple grounds where we could lift up an iron cover, drop down into the tunnel and there be perfectly safe.” Bossard’s odyssey didn’t quite turn out the way he had planned, but this left the public with clear confirmation of tunnels under the temple and a sense of intrigue and mystery that has yet to subside. 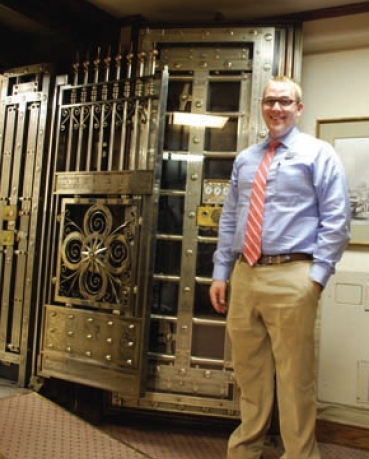 Gavin Goodwin from Zion’s Bank took Utah Stories on a tour of the vault near where the “Old Clock” water mill tunnel was located. Some of the tunnels are open to temple patrons. Many Mormons have walked the tunnels en route to baptisms, weddings, etc. Most describe them as wide, well-lit, ventilated, comfortably heated, carpeted, and boring. The photo below shows the interior of the annex to temple tunnel. Note the skylights in the ceiling and on Temple grounds. 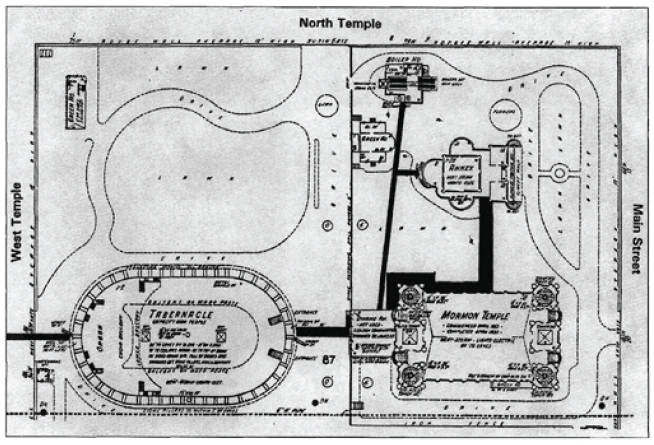 1911 map of the temple. Heavy black indicates where tunnels are located. Tunnels also emanate from the city/county building on Washington square. The most famous is a tunnel between the library and the city county buildings. 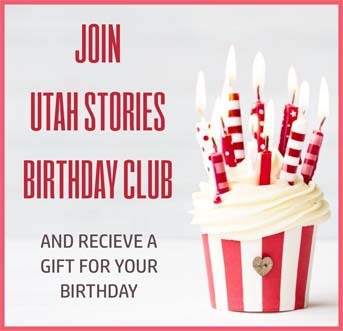 The site of the current library is where the Salt Lake Jail used to be, and it’s tunnel was used to transport prisoners between the buildings. According to the old-timer who showed me the tunnels, Ted Bundy was the last prisoner to walk the tunnel. Now there’s some actual SPOOKY! The original tunnel has been mostly blocked off since the building was earth-quake proofed. The new tunnel exists mostly to connect utilities. One of the earliest usages of tunnels in downtown was to power a public clock that has rested on Main Street and 100 South for well over a century. The clock was installed years before electricity was available. The enormous size of the clock probably would have required someone to wind the clock daily. To prevent this manual labor, the pioneers and the clock maker came up with an ingenious method to use an underground water mill to power the clock without manual intervention. How they managed to regulate a consistent timekeeping device with inconsistent waterflow is uncertain, but the waterwheel likely compressed a spring, whereas the spring provided the power as it decompressed, turning the cogs.